ADINA (Automatic Dynamic Incremental Nonlinear Analysis) – a universal program that works on the basis of the finite element method used for engineering linear and nonlinear calculations. ADINA allows solving structural and temperature problems, calculating flow, conducting multi-physical and electrostatic simulations. The introduction of the program in the development or production of the product is the best solution to reduce the cost of prototype production and reduce the time of their testing. The modern calculation methods underlying the ADINA program distinguish it favorably from other programs due to accurate and reliable results of solving nonlinear problems. NX Nastran uses ADINA as a module for non-linear calculations. ADINA Structures – the module for calculating the static and dynamic strength of solids and structures. The calculation can be carried out both in linear and in highly nonlinear formulations, taking into account the nonlinearity of the material, large deformations and contact. ADINA CFD is a software package for simulating compressible and incompressible fluid flows using finite-volume and finite-element sampling. ADINA Thermal is a software module for solving heat transfer problems in solid bodies and structures. ADINA-FSI is a module designed to analyze the interaction of a flow and a design, and it is possible to consider highly non-linear behavior of a material due to large displacements, inelasticity, contact and temperature dependence. ADINA-TMC – a software module designed to solve related thermal strength problems, when thermal phenomena affect strength, and vice versa. 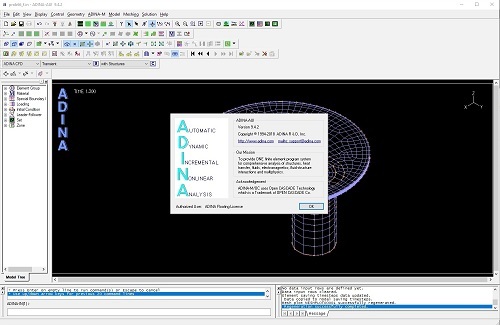 ADINA User Interface (AUI) is a pre- and postprocessor module that allows you to create and edit geometric and finite element models and visualize calculation results. Compatible with all modules of the complex. ADINA Modeler (ADINA M) is an embedded AUI module that uses the Parasolid graphics core and provides solid modeling and direct interaction with other CAD systems using Parasolid (Unigraphics, SolidWorks, Solid Edge). Developer: ADINA R & D, Inc.